The DCSD Board of Education approved a resolution for a conditional charter renewal contract on January 8, 2019 for the STEM School Highlands Ranch, which states: "If the School fails to satisfy the conditions precedent set forth in this Resolution, then such failure shall excuse the Board from renewing the School's charter and charter contract." FAILURE to manage a fiscally conservative budget as the STEM Board approved an exorbitant salary of $278,000.00 with a bonus in 2017 of $55,600.00 for the STEM Executive Director. FAILURE to provide a STEM Parent Complaint and Communication Policy to meet the first DCSD BoE condition for charter approval. The January 8, 2018 resolution states: "Evidence that the school has adopted a parent complaint and communication policy, that the School has incorporated such policy into its practices..."
FAILURE to meet the academic needs of ALL students including those on an IEP/504 Plan. There have been nine OCR lawsuits filed against STEM School since 2016 including one currently pending. FAILURE by the STEM Board of Directors to heed the advice of the May 17, 2018, DCSD Board of Education letter that suggested that a change in leadership should be considered because the STEM Head of School had not provided effective leadership. On January 23 and 29, current and former parents exercised their first amendment rights to inform the school community about the DCSD concerns for non-renewal by handing out flyers to STEM parents on public space. In response, the STEM School Board President and Executive Director issued an email to the school community on January 30, attributing the protests to "complete outsiders." These claims are false, as current and former STEM parents have organized the protest. In addition, the tone in the email sent to the parent community gave the impression that there was nothing to worry about. This was a direct contradiction to the "death knell" comment made by STEM to the DCSD BoE. Furthermore, a STEM administrator and school security confronted the concerned parents, dubbed "complete outsiders," in an effort to discourage parents from exercising their rights. In fact, the STEM School Board President, Mr. Mark Alpert, confronted the STEM parents and took their pictures with his camera. However, no attempt was made to listen to their concerns. These actions are examples of the school's failure to properly handle parent concerns. It further jeopardizes the STEM School's chances of satisfying the conditions set forth in the contract resolution by April 1, 2019. Please contact me if you can volunteer and what day is best for you. We will provide the flyers. Thank you for signing the petition to the Save the STEM School Highlands Ranch Charter. 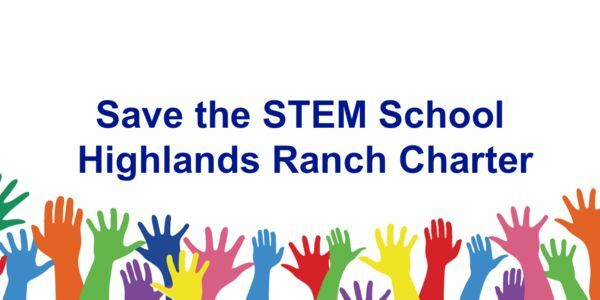 Please go to our new Facebook Page, "Save the STEM School Highlands Ranch Charter" and join our group. Please ask your Facebook friends to also join the page.